There’s no City Council meeting this week, as staffers prepare for the initial presentation of the annual municipal budget. As a reminder, our City Fiscal Year starts on July 1, and the Council will be working on the budget through April and much of May. Meanwhile, I wanted to pass along three important announcements and provide updates on several important issues. Eastern Avenue Infrastructure Meeting. Given all the construction activity along Eastern Avenue (which lies within the District of Columbia), Ward 4 DC City Councilmember Brandon Todd is coordinating a public cross-jurisdictional meeting on Thursday, April 4 from 6:30 - 8:00 PM to discuss Eastern Ave. road and utility infrastructure projects. I’ll be attending, along with Mayor Stewart and Takoma Park Councilmember Kostiuk, plus representatives of both the District’s Department of Transportation and utility companies including Pepco, and also Takoma Park City staff. The meeting will be held at the Takoma Park Seventh Day Adventist Church’s Keystone Room (6810 Eastern Avenue, across from Pizza Movers). Takoma Junction. At last week’s Council meeting, NDC made a presentation on their revised site plan: https://documents.takomaparkmd.gov/government/city-council/agendas/2019/Documents/takoma-junction-update-pres-2019-03-20.pdf. The presentation took place the day after a meeting of the County Planning Office Development Review Committee (DRC) on the project. Based on the results of the DRC meeting and the written comments submitted by some of the DRC technical experts, there’s a decent chance there will be further substantial changes to the project. In addition, it’s clear that the time frame for considering additional modifications will stretch out farther than we had anticipated. Before getting to the DRC details, I think it will be helpful to provide some background. As noted previously, the new plan calls for a smaller structure than in the site plan approved by the Council last year. To be specific, the building in the new proposal would have about 25 percent less square footage than the previous design did. Under the site’s zoning requirements, the earlier larger structure would not have been allowed unless NDC was able to purchase development rights from other nearby businesses. When that effort failed, they had to reduce the size. As someone who was opposed to the site plan approved last year largely because I thought it included an insufficient amount of public space in the front of the development at street level, it’s hard to be disappointed in a substantial square footage reduction. However, in the revised plan all the reductions in square footage are at the rear of the building. This may be positive because the building would intrude less into the green space in the rear. But the front façade is unchanged from what it looked like in the earlier larger plan, meaning my concerns about public space haven’t been addressed. That brings us to the DRC meeting. At the meeting, the State Highway Administration asked that there be no vote by the County Planning Board on the project until SHA’s community “visioning” process regarding potential changes to the configuration of the Junction intersection is completed. That means a delay at least until sometime in the fall. In the DRC comment process, the Montgomery County Department of Transportation staff expressed opposition to the lay-by. And the Historic Preservation Commission (HPC) representative expressed a number of concerns, and recommended, among other things, moving back and possibly breaking up the building’s façade, and lowering the height. As noted earlier, I share this concern about the façade. I also agree the height is excessive in the current version of the site plan. Library. 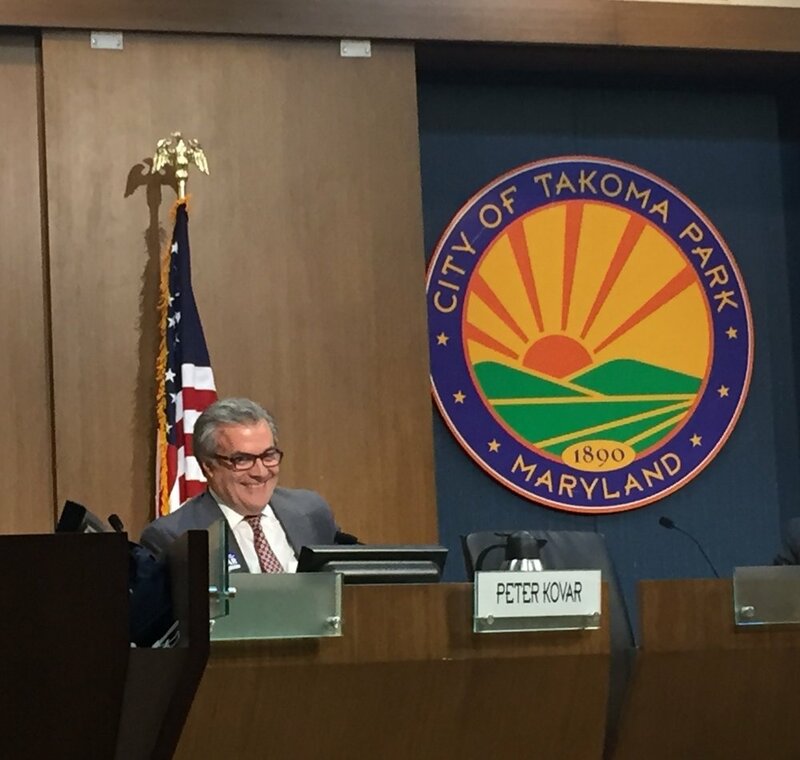 At this past week’s Council meeting, we had a presentation from Greg Lukmire, the architect with whom the City has contracted for the Library renovation: https://documents.takomaparkmd.gov/government/city-council/agendas/2019/Documents/takoma-park-md-library-update-pres-2019-03-20.pdf. I believe the City Library is one of our best local institutions. Throughout the day, you can see people there from all ages and backgrounds, from toddlers with their parents and babysitters at morning Circle Time, to students from Takoma Elementary and Piney Branch during school hours, to older students studying in the afternoon, to seniors catching up on periodicals, to all kinds of folks using the computers or attending the excellent presentations from authors and outside speakers. Some people even borrow books! Since it’s such an important community resource, I’ve been an enthusiastic supporter of the plans to renovate it. I’m convinced that upgrading it will be a valuable investment for the City. For construction, we’ve secured $7 million in bond funding and -- with the help of our State Delegates and Senator -- an additional $300,000 in direct State funding. With the City Council having approved an initial renovation design, and the construction monies in hand, a key next step in the project was the completion of a flood plain study. The County required this, and the City Council and staff agreed we should have that information before we moved toward the more detailed design phase. As outlined by Mr. Lukmire, the flood plain information shows that simply adding onto the existing building will not be sufficient to provide an appropriate level of flood protection. He explained in his presentation that his firm developed three options to address the flood plain study’s findings: 1) rebuilding the parking lot and the slope behind it; 2) raising the floor in the existing structure; or 3) razing the building and reconstructing it with a higher floor level. Mr. Lukmire recommended the third option. It falls in the middle in terms of cost -- at $7.5 million it’s a modest amount above the financing we’ve already acquired. It also allows for a few more improvements to the structure and the way it blends with the Community Center. And it meets the County and Army Corps of Engineers flood plain requirements. I’m persuaded that the third option is preferable, and I’m pleased that we’ll be moving forward into the more detailed design phase with that option. I do want to make sure we hold the line on the construction costs, and I’ll be working with my Council colleagues to monitor the expenses carefully. We’ll be getting additional details about costs when we get into our budget discussions next month, and I hope we’ll be able to discuss whether some adjustments to the project that may make sense at that time. I would add that I appreciate the concerns that have been raised by some residents and Councilmembers about considering additional steps in the project to address flood control, especially given the climate change trends we’re seeing. In fact, I emphasized this point myself during our discussion in last week’s meeting. We’ll be reviewing the flood plain study findings in more detail as we move forward to help determine whether further changes along those lines are needed. Tree Seminar. The Council has set as one of our priorities for this year working on a three-pronged approach to tree policies in the City. First, develop for the first time tree canopy goals, with an implementation plan for achieving the goals. Second, consider changes to the tree ordinance to address concerns that have been raised by some residents about its complexity and need for more flexibility. And third, explore ways of increasing community outreach and education on tree health and maintenance. On Saturday, we had a half-day seminar and discussion on tree canopy issues, which I think was an important kick-off to our work on these topics. The morning session on Saturday was led by University of Vermont Professor Noah Ahles, who provided a fascinating analysis of aerial tree canopy data that was compiled through LiDAR technology. In the afternoon session, there was a focused discussion on the data and trends presented in the morning. Participants included Prof. Ahles, City Councilmembers, members of the Committee on the Environment and the Tree Commission, City staff, and several members of the public. Understanding current canopy trends and figuring out how best to set goals and the policies that could enable us to reach them will be a complex challenge, but I think we’ve gotten off to a good start. Key findings from the LiDAR data included the following. On a Ward by Ward basis, the City is more heavily treed in Wards One, Two, Three and Five. In addition, while the LiDAR data show a roughly flat canopy percentage across the 2009, 2014 and 2018 data years, there’s a 4 percent drop between 2014 and 2018. Whether this actually means we’re experiencing a one percent per year decline (perhaps owing to factors such as climate change, other human activity here in the City, old age, or pests), or this is a function of the type of random variation that can often be seen as part of a data gathering system of this kind isn’t clear. Prof. Ahles appeared to believe it was the latter. On the other hand, his presentation did show a noticeable decline of larger (and probably older) trees in recent years especially in Ward One. Meanwhile, there appeared to be less loss of tall trees in areas along Sligo Creek, where perhaps the fact that there are more trees grouped together may give them protection, at least from wind storms. County Accessory Dwelling Proposal. County Councilmember Hans Riemer has proposed changes to the zoning rules relating to ADUs, including: eliminating the distance requirements between ADUs (so it would be easier to have more than one ADU per block), lessening the parking requirements, permitting existing detached structures (like garages) to be retrofitted into habitable spaces without regard to normal setback rules, allowing owners of homes with ADUs to rent out their main house and live themselves in the ADU, and (with some size restrictions) authorizing the construction of new unattached living structures (at most one per lot). It’s my view that adding some flexibility along these lines can be a useful part of a larger affordable housing plan. However, some of these proposals are more controversial than others. It’s my sense that -- as the County Council process moves forward -- we’ll likely see a number of changes, with the most flexibility in attached ADUs, some loosening up of the rules on previously existing detached structures, and a more narrow liberalization on new detached units. In last week’s City Council meeting, we approved a resolution that was broadly supportive of Councilmember Riemer’s proposal, in order to encourage continued work on it, given that a number of municipalities had expressed total opposition. I voted for the resolution because I thought it made sense to keep the County process moving along, though I was uncertain about some aspects of it like the setback requirements. I also understood there would likely be some changes to the proposal as it advanced in any case. Our resolution called for two exceptions to Councilmember Riemer’s proposal. First, that municipalities would be allowed to handle inspection of single family ADUs that otherwise needed no external zoning review, provided the local government had an appropriate licensing program. And second, a suggestion I made that municipal governments be allowed to set their own parking requirements relating to ADUs. I also authored language that was included in the resolution clarifying that existing requirements relating to design and construction review within designated historic districts would still apply. There will obviously be much more to come on all of these issues. I apologize for a longer, more detailed message than usual. These are complex issues, and I thought that, with no Council meeting this week, it would be a good time for a deeper dive. I’d be happy to answer questions via email on any of these matters, or talk on the phone or in person with anyone who would like to explore them in more detail.